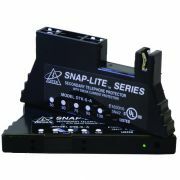 The DTK-SL50B offers 50V, 66 block snap on surge protection with diagnostic LED, for analog circuits. The DTK-S30A offers 50V, 66 block snap on surge protection with a 150mA self-resetting fuse, for digital circuits. The DTK-S50B offers 50V, 66 block snap on surge protection for digital circuits. The DTK-SL50A offers 50V, 66 block snap on surge protection with a 150mA self-resetting fuse, for analog circuits.